My art reflects one of my great joys of observing people interacting with each other and their environment. I reference in my sculpture the body language that we often use subconsciously to convey meaning and drama in our communications. My early training as a classical dancer taught me the use of subtle angles and nuances of posture help to create a mood and story line. Art should be the conduit to communicate with the observer on a real, visceral and intellectual level. The viewer can then become part of the process, relating to the work on a personal and intimate level. When successfully accomplishing this interaction, art comes alive and is then accessible. My sculpture reflects a technique that exaggerates aspects of the human form. Using slight distortions and elongations, I can create more emphasis and drama about our inner dialogue and feelings. Without losing the beauty of the human form, my work remains representational, but evocative and contemporary. As stated by a New York critic about her sculpture†, "Such unadorned expressions of human empathy are unique" and she creates "a mixture of pathos and dignity which honors our common condition." My intention is to "express the psychological core of our human drama…restoring a sense of the monumental to the human figure." This connection to the viewer is my objective, and I consider my art a success when it evokes an emotional response. 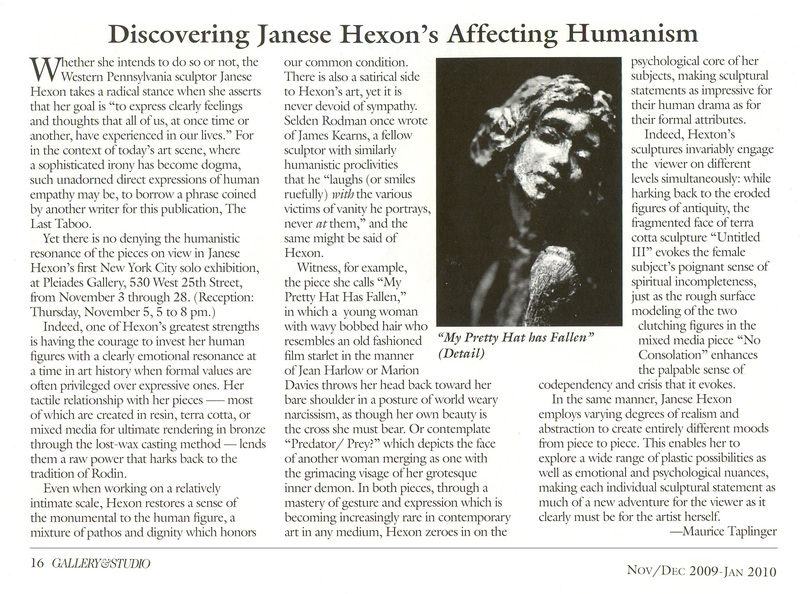 †Solo Exhibition Review, Maurice Taplinger, Gallery & Studio, New York, NY, Nov 2009.